Steez Promo and Club Glow present the Mid-Atlantic region's premier music event, Moonrise Festival, which returns to Pimlico Race Course in Baltimore, MD on Saturday, August 11th and Sunday, August 12th. Since its debut in 2014, Moonrise Festival has grown into one of the most anticipated East Coast festivals of the summer, and has presented the industry's top acts. 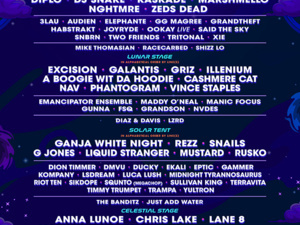 Moonrise Festival touches all corners of the dance floor with styles spanning from heavy-hitting bass to hip hop, live electronic acts to house music, and everything in between. The event also features art installations, a sprawling vendor village, amazing food and beverages, stylish VIP lounges, and more.